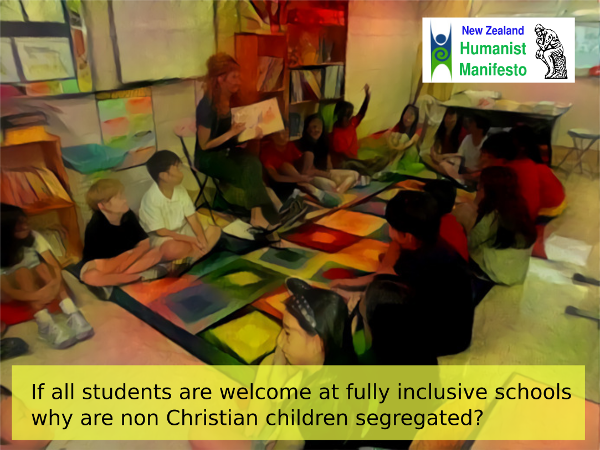 We strongly support repeal of the sections of the Education Act which support religious indoctrination in state schools. We believe these provisions allow school boards to discriminate against children in their schools on the basis of belief. It serves to alienate minority cultures and to reinforce bigotry. State schools should be safe and welcoming for all children, regardless of their gender, ethnicity, sexual orientation or belief. If we are really committed to teaching our kids tolerance we cannot in good faith continue to exclude and segregate children. There is ample opportunity for parents of faith to introduce their children to their religious or cultural beliefs. There is no justification for the state imposing the beliefs of the majority, or even the minority, onto others.